The APG® Air Plethysmograph is the only system that measures true blood volume changes in milliliters and blood flow in milliliters per second. The APG® system senses pressure changes in a large cuff that extends from knee to ankle, which is calibrated in milliliters using a calibration syringe. First, the patient is supine and outflow testing identifies obstruction and the degree of superficial collateralization. Next, the patient is asked to stand and the filling rate of the veins by reflux through incompetent valves is measured. The patient is then asked to do a toe-up exercise and the calf muscle pump function is measured as an ejection fraction. Finally, the patient does 10 toe-ups quickly and a non-invasive measure of ambulatory venous pressure is completed. The presence of chronic obstruction usually indicates a post-thrombotic limb. If the saphenous system is measured to be the limb’s primary outflow collateral by the APG®, its removal may become problematic for the patient. Reflux in the deep and superficial veins are separately quantified to allow the physician to understand how the two systems contribute to the patient’s symptoms. Poor calf muscle pump function may be due to obstruction, varicose veins calf perforator reflux or the patient’s inability to perform exercise from arthritis, stroke, etc. The APG® is now used in studies to identify patients for the new subfacial endoscopic perforator surgery (SEPS). Both reflux and poor calf pump function are related to clinical manifestations of the disease. The APG® Air Plethysmograph helps identify and follow-up patients that are good candidates for deep venous reconstruction. Also, as testing can be performed over compression garments, the effectiveness of elastic or non-elastic compression devices can be assessed and tailored to the individual patient. Other uses for the APG® include its use in selecting the best arm for dialysis access graft or AV fistula. Arterial inflow can be measured to identify patients that are the best candidates for drug therapy (such as synthetic prostacyclin) and for follow-up to vascular interventions. For those with an already basic knowledge of how to use the APG® System, download the printer-friendly APG® Advanced Course (PDF) for in-depth instructions. 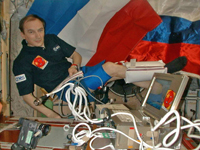 Use of air plethysmography during the French-Russian mission EO 22 on board the Mir Space Station. Modified APG® for Mir Space Station. A modified version of the APG® has been used on the Mir Space Station to quantify the effects of prolonged microgravity on peripheral vascular tone in arms and legs. Under contract to CNES, the APG® was part of the PHYSIOLAB project on the Mir Space Station. The APG® was used to assess Mir Space Station APGcardiovascular deconditioning in cosmonauts during spaceflights. F. Louisy, C. Andre-Deshays, D. Cauquil, M. Lazerges, C. Lafaye, A.L. Camus, P. Schroiff, and G. Gallina. Frontiers in computed-aided visualization of vascular functions, Blazek V and Schulz-Ehrenburg U (Eds.). Proceedings of the Seventh International Symposium CNVD 97, Jan 10-12, Paris, France, pp 153-159. The International Space Station also commissioned a modified APG® from ACI Medical for the Cardiolab project.